Every day, hundreds of thousands of messages advertising ghostwriting agencies are sent out across Chinese social media platforms. "Our professional ghostwriting agency provides all sorts of essays: speeches, work summaries, professional movie critiques, fiction, self-introductions. We also provide ghostwriting for English essays, assignments, reports, papers, contact us!" reads one advertisement in a WeChat group. Searches on the Internet pull up similar results: "Original ghostwriting essays," "Successful Ghostwriting," "Ghostwriting homework for students studying abroad," and "Ghostwriting love letters" are just some of the top results. Ghostwriting has existed in China for many years. The Chinese government once issued some policies trying to stem the problem, without succeeding. Chinese students studying abroad are also using these "resources" for their English-language academic papers. And as their numbers increase, the issue becomes even more serious. 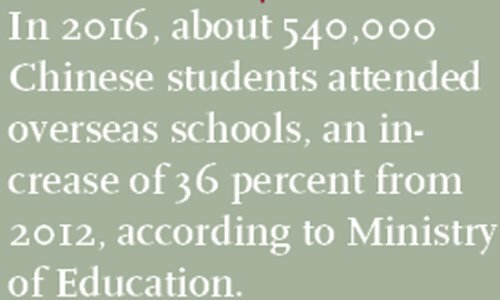 According to data from China's Ministry of Education, in 2016 about 540,000 Chinese students attended overseas schools, an increase of 36 percent from 2012. Out of that number, 78 percent went to native English-speaking countries such as the US, UK and Australia. Different from in China, where academic rules are more relaxed and often unenforced, when Chinese students who are enrolled in foreign schools are caught using ghostwriters, they face severe punishments including expulsion. Many Chinese students use such services because they feel they have no other choice. Aileen, a Chinese college student in the UK, told the Southern Weekly that she was afraid of not getting her diploma, so she turned to ghostwriting services to write all her papers, spending hundreds of thousands of yuan in the process. Aileen majored in management and wanted a master's degree in the same field. The education agency she applied through suggested she major in International Developmental Management. She did not carefully read the details of this major, and by the time she started school in the UK she realized it was far different from what she had expected. The course required heavy policy research, which she felt she could not handle. During her first semester, Aileen found herself a relatively affordable ghostwriting agency, but still ended up failing four of her classes. During her second semester, Aileen spent an additional 80,000 yuan ($12,193) to buy more ghost-written essays. She had to ask her parents for money without telling them what it was being spent on. Even though all those papers received passing marks, she herself still failed her final exams. On the verge of flunking out of school, instead of simply studying, Aileen became even more dependent on ghostwriting agencies, believing that if she could just find herself the most expensive and most dependable agent, she'd be able to graduate. According to Whole Ren Education, a private research center, in 2014 about 8,000 Chinese students were kicked out of American universities due to cheating or plagiarism. On Chinese question and answer site Zhihu (China's version of Quora), many students admitted anonymously that they have used such services out of a fear of flunking and not graduating. Many also blamed the language barrier or the way foreign universities conduct their courses, which is far different than at Chinese universities. "What's the point of education? I think over 90 percent of my classmates just want to get a good job and have a better future," one student wrote. "So is studying hard really the way to get there?" Another student contacted by Southern Weekly said he tries to write his college papers himself, but seeing his peers achieve excellent grades through ghostwriting agencies, even though they spend all their free time partying and drinking alcohol, makes him feel that life is unfair. "I don't know how long I can last," he told the Southern Weekly. "Maybe I'll find a ghostwriter for my next paper." Spurred by the massive demand, ghostwriting agencies for Chinese students have existed for decades, with those who pay for them being directly responsible for their continued existence. 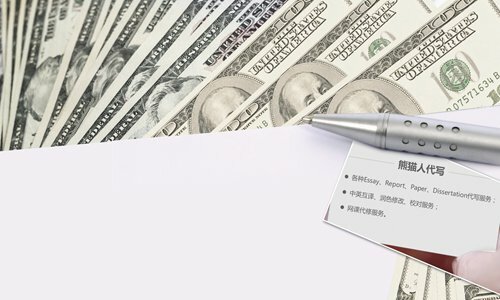 Agents usually advertise their ghostwriting services on WeChat and QQ groups, as well as Internet forums where overseas Chinese students congregate. Once the agent receives a query from a student, the agent emails their ghostwriter the request and specific instructions, and the writer gets to work. Most ghostwriters are paid 300-400 yuan per 1000 words, but the essays must receive a passing score in order for the ghostwriter to receive payment. Wu Wenhao, an agent in his early 20s, told the Southern Weekly that he has a "good reputation" and endless clients, who usually pass. "I earn nearly 100,000 yuan per month," he bragged. Wang Hong (pseudonym) worked as a ghostwriter a few years ago while she herself was still in college. She was approached by an agent who asked if she would like to "make a few extra bucks" by writing essays for her fellow students. Wang showed a list of all the paid essays she has ever written to the Global Times, which covered a wide range of topics, from finance and linguistics to history and literary studies. Some were just simple freshman-year essays, such as book reviews. The Global Times asked Wang why the students could not handle such simple assignments. "They probably didn't want to bother to read the book," Wang shrugged. For more difficult topics, Wang spent more time on research and citing multiple sources. But in her opinion, the work was always quite easy, and so was the money. Nonetheless, after just a couple of years, Wang quit ghostwriting. "It was a way to make some money during my school days," she said. "But I have found more noble ways to earn a living now." The booming ghostwriting business might be over soon, as many foreign schools have finally begun to crackdown on the problem. In January of 2017, after British media reported on the use of ghostwriters among overseas Chinese students, the UK government outlawed ghostwriting academic papers, with stiff punishments for offenders. For many Chinese students, however, they don't understand the severe consequences of plagiarism. In China, the phenomenon is so unhinged that it has become a prevalent part of campus life. In 2013, China's Ministry of Education released a policy saying if dissertations are counterfeited, the author will be warned, disqualified from teaching or even fired. However, the phenomenon still went on as usual. Wang, the former ghostwriter, confirmed this to the Global Times. "Once I wrote a doctoral dissertation for an associate professor of a Chinese university," she admitted. At foreign universities, "contract cheating" and "plagiarism" are subject to academic punishment. UK's Quality Assurance Agency for Higher Education (QAAHE) released new guidelines this year saying it will crack down on companies offering such services and punish students who purchase them. The QAAHE also said it now has software that can determine whether a paper has been plagiarized or ghostwritten. In the US, plagiarism violates the ethics standards of most universities; violators face failing grades and expulsion. But this is no guarantee that the phenomenon can be completely stopped. Analysts say that to rid this issue from the root, good moral values must be instilled in Chinese students early on.